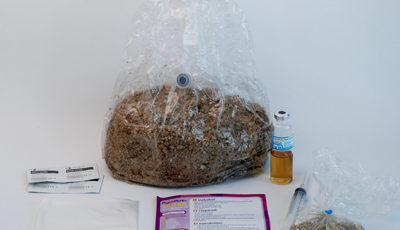 The mushroom substrate kilo kit is a pre made substrate bag with a spore injection port. This mushroom grow kit contains sterilized substrate made of vermiculite/brown rice flour , also called PF Tek or BRF. The mushroom substrate bag comes with a 25ml vial of liquid culture, a medium were you can germinate your mushrooms spores in before inoculation. The mushroom substrate bag is easy to use. You only have to inject the mushroom spore strain of choice into the substrate to start growing your mushrooms. The substrate is big enough to produce a great yield, Let's get started!